When you see the size of small astronomical instruments sold in specialty stores, they only impress novices. On the other hand, a telescope of 200 mm in diameter measuring between 1.5 and 2 m in height like the one presented above on the left intimidates already an amateur informed by its proportions and the quality of its images. So imagine a telescope 1.5 m to 1.8 m opening as some amateurs have built (see the article on Dobson telescopes). It is disproportionate and very impressive. It is even more so when we know that despite a weight greater than 100 kg we can handle it alone. Whoever has the chance to observe the sky with the eyepiece of such a giant remembers all his life so the show is dazzling, in every sense of the term (see these images of Jupiter and M13 taken to through telescopes of different diameters). 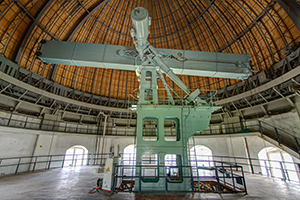 Now imagine a telescope housed under a tall dome like a building! As we see below, at the end of the 19th century the optician engineers did not hesitate to make giant astronomical glasses whose objective measured 83 cm in diameter (Observatoire de Paris), 91 cm (Lick Observatory ) and even the record 102 cm in diameter (Yerkes Observatory). Some of them are still used, certainly more to observe or photograph the deep sky but especially to study the suburbs of the Milky Way and nearby objects such as asteroids. Because of their location often close to major cities and their limited separating power, today these large astronomical glasses of other age are relegated to additional tasks in favor of large telescopes mirror. In California, some 80 km south of Pasadena is one of the most prestigious telescopes in the world, which for a long time remained unrivaled: the 5-meter diameter Hale telescope on Mount Palomar. This very impressive instrument makes it possible to explore the depths of the Universe with such a resolution that it served as a model for the largest telescopes of today: the BTA-6, Magellan and MMT (~ 6 m in diameter), the VLTs, Gemini and Subaru (~ 8 m diameter), Keck (9.8 m diameter) and GTC (10.4 m diameter), and telescopes four times larger in a few years! But a sign of progress and of necessity, for more than half a century, no astronomer has any more eyes on the eyepiece of these giant telescopes, which in any case are not equipped for this purpose, the large CCD sensor like a suitcase that has replaced the eyepiece for a few decades now. Only telescopes 1 to 2 m in diameter and large astronomical glasses over one meter in diameter are still equipped with an eyepiece and a guide bezel. But their use becomes anecdotal.